Bhupen Hazarika’s son Tej has expressed his utter discontent at the way the BJP-led Centre is pushing forward the Citizenship (Amendment) Bill. Bhupen Hazarika’s son Tej Hazarika has expressed his utter discontent at the way the BJP-led Centre is pushing forward the Citizenship (Amendment) Bill. He has even decried the ‘Bharat Ratna’ conferred upon Bhupen Hazarika, and has said that the Bill and the Center’s move far outweigh the importance of the highest award of the country. The declaration of the posthumous award to Bhupen Hazarika could not evade sharp reactions in Assam. Though people were happy to see the ‘bard of the Brahmaputra’, their beloved Bhupen da to have received the award, even though posthumously, largely it has been viewed as a pressure-releasing valve for the BJP. This Bharat Ratna has also been compared to the ‘Jnanpeeth’ award given to Birendra Kumar Bhattacharya, an admired Assamese novelist during the tumultuous days of Assam Movement. Prime Minister Narendra Modi, in a public meeting near Guwahati, on Sunday invoked Bhupen Hazarika. He also iterated BJP’s firm position in favour of the Bill and how determined they are to get it passed in the Rajya Sabha. Modi, who was welcomed with black flags on the day of his arrival in Guwahati, kept on assuring people that the interests of the people of the Northeast (NE) and especially Assam would not be harmed by the bill. Despite PM’s promise, waves of protests continue to shake Assam, Manipur and other parts of the Northeast. Students of Dibrugarh University in Assam have written letters to CM Sarbananda Sonowal with their blood to mark their protest against the Citizenship (Amendment) Bill. As per the media reports, students drew their blood using syringes and by cutting their fingers with blades to write letters to Sonowal, urging him to scrap the bill. Ima Kheitel or the Mother’s Market of Manipur – a market run entirely by women – has been complete shut down due to the round-the-clock sit-in since Saturday morning. Police action reportedly injured six women protesting at Ima market on Sunday, and two students participating in a rally called by six students’ organisations in Manipur. The authorities have now imposed prohibitory orders, Section 144 in both Impahal East and Impahal West, and internet connectivity has been shut for five days across the state. It is also feared that the situation can further aggravate if the Bill is passed in the Rajya Sabha on Tuesday. 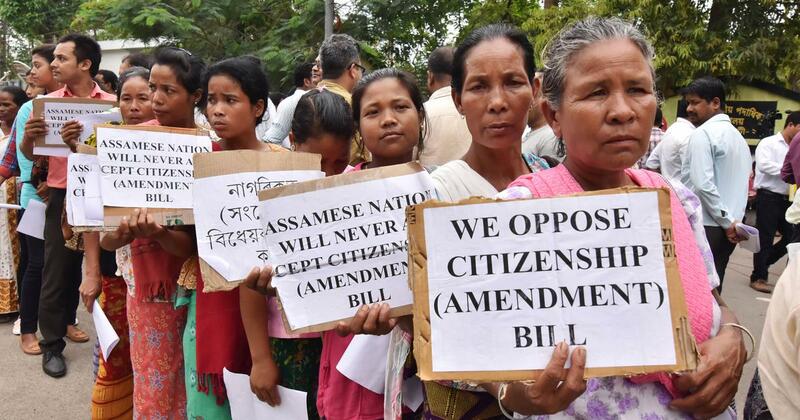 The Citizenship amendment Bill was supposed to be tabled in the Rajya Sabha on Tuesday, but amid protests over various issues, it has been adjourned till tomorrow. While the bill was passed in the Lok Sabha last month, it would not be easy for the BJP to get it passed in the Rajya Sabha. Here comes into play the role primarily of the Congress and other parties that claim to stand in favor of secularism. All these parties united would surely defeat the NDA in the Rajya Sabha, and Congress can take a leading initiative in this regard. In the first week of February, several organisations and civil society forums met Congress President Rahul Gandhi ahead of the tabling of the Bill in Rajya Sabha. Three delegations—one led by eminent scholar and activist Dr. Hiren Gohain, other two led by AASU advisor Samujjal Bhattacharya and Akhil Gogoi—met the Congress president separately. The delegations also met other party leaders in the opposition in a bid to mobilise votes against the bill. As the bill goes against the fundamental values of secularism enunciated in the constitution, it becomes pertinent for all who stand against communal divisive politics proffered by BJP and RSS.